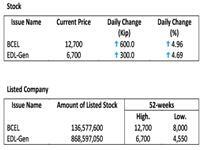 Anticipating the current trends, investors unwaveringly step onward with their biddings again this week, pushing the prices of BCEL and EDL-Gen to an astounding 12,100 Kip and 6,400 Kip per share respectively. 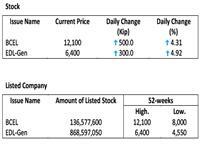 As of today, the price of BCEL’s shares enlarges by 500 Kip (4.31% gain), and EDL-Gen increase by 300 Kip (4.92%). The government is considering waiving taxes on share trading to boost investment in the Lao Securities Exchange (LSX), according to a broker.